Headlines: On target for containment by July 3, 2008. Current Status: Good progress yesterday combined with successful efforts last night, leaves only one half mile of open line south of the Arroyo Seco River on the Indians Fire. Interior burning will take place today to reduce unburned vegetation within the fire perimeter. Arroyo Seco Road is closed to the public from the junction of Arroyo Seco Road and Carmel Road to the west. All national forest lands north of the Nacimiento-Fergusson Road are closed to public access. Arroyo Seco-Indians and Cone Peak Roads are closed. Memorial Campground, Escondido Campground, and Arroyo Seco Campground and Day Use Area are closed. Nacimiento-Fergusson Road is open, as well as coastal campgrounds and day use areas south of this road. Closures are subject to change at any time based on fire conditions. The Arroyo Seco Road area is under MANDATORY evacuation above junction with Carmel Valley Road. A fire evacuation ADVISORY is in effect for Carmel Valley Road from Arroyo Seco Road north to the Tassajara Road; the Tassajara Road south to the forest boundary and the Cachagua Road to Nason Road turnoff. The evacuation for cabins in the Santa Lucia Tract remains in effect. The Red Cross evacuation center is located at 490 El Camino Real at the Greenfield Elementary in Greenfield, CA. The SPCA for Monterey County will operate an emergency animal evacuation shelter for household pets (dogs, cats, etc.) adjacent to any American Red Cross evacuation site. Please contact the SPCA first at 831-373-2631 or at 831-646-5534 (after hours) for information on evacuating horses and livestock. Fire Weather Watch - North Bay Mtns. THE NATIONAL WEATHER SERVICE SAN FRANCISCO BAY AREA HAS ISSUED A FIRE WEATHER WATCH...WHICH IS IN EFFECT FROM 4 PM PDT THIS AFTERNOON THROUGH LATE TONIGHT. VERY WARM SURFACE TEMPERATURES THIS AFTERNOON WILL DESTABILIZE THE ATMOSPHERE BY LATE IN THE DAY. WITH SOME MOISTURE AVAILABLE AT THE MID-LEVELS RESULTING INSTABILITY WILL THREATEN HIGH-BASED THUNDERSTORM ACTIVITY FOR THE HIGHEST TERRAIN IN THE NORTH BAY COUNTIES AREA. WITH THE HIGH TEMPERATURES AND SMALL AMOUNT OF PRECIPITATION THAT ACCOMPANIES HIGH-BASED THUNDERSTORMS...DRY LIGHTNING IS A POSSIBILITY FOR THE HIGH TERRAIN OF THE NORTH BAY COUNTIES OF NAPA AND SONOMA. Governor Arnold Schwarzenegger proclaimed a state of emergency in Mendocino and Shasta Counties as a result of lightning strikes that ignited more than 230 wildfires in these counties. The proclamation utilizes all resources consistent with the state's authority under the California Disaster Assistance Act. Yesterday, the Governor visited the command posts for the Basin Complex Fire in Monterey County and the BTU Lightning Complex Fire in Butte County. He also announced $20 million for the California Department of Forestry and Fire Protection (CAL FIRE) to cover the costs of the Humboldt and Ophir Fires in Butte County earlier this month. Because the Governor declared a state of emergency for those fires on June 11, the state was able to immediately process the Executive Order and distribute the money. Also, to help the victims of the Ophir and Humboldt Fires in Butte County and the Martin Fire in Santa Cruz County, the Governor on Sunday signed an Executive Order to waive fees and assist with recovery efforts. On Monday, Governor Schwarzenegger proclaimed a state of emergency in Monterey and Trinity Counties as a result of the Basin Complex Fire, Gallery Fire and Lime Complex Fire. On May 9, 2008, the Governor issued Executive Order S-03-08, which boosted the state's preparedness for wildfire season and directed CAL FIRE to immediately mobilize critical firefighting resources and personnel to save lives and homes statewide. Butte County Fire complex- 6-26 2000hrs - Precautionary Evacuation Advisory - The Butte County Sheriff’s Office has issued an “Precautionary Evacuation Advisory” for the North and South Coutolenc zones which encompass Coutolenc Rd. from Skyway to Hupp-Coutolenc Rd. and all cross streets. The West Fire has moved south of Bean Soup Bar but is still on the east side of the West Branch of the Feather River drainage and poses a threat to the Coutolenc road area. If the fire crosses the drainage, the Precautionary Evacuation Advisory may be upgraded to an “Immediate Threat Evacuation Advisory”. Residents are advised to prepare their home, animals, and family members and evacuate. Large animals should be moved during the precautionary evacuation to prevent delays during an immediate threat evacuation. Communicate with neighbors to ensure everyone has the Advisory information. This Joint Information Center (JIC) is providing support to all the fire information centers and the CAL Fire state and Forest Service regional offices. California (CFN) — Firefighters continued making progress against raging fires in northern California Wednesday as Cal Fire and the United States Forest service had achieved 100% containment on approximately 35% of the large fires burning in the State. More than 149,000 acres (60,300 hectares) has been burned so far, destroying nearly 40 structures and forcing the evacuation of more than 900 people. A total of 7,000 firefighters, 536 engines and more than 50 aircraft had been deployed to pummel the flames, most of which were triggered last week when dry lightning from thunderstorms struck drought striken tinder-dry forest land. Current conditions: Smoke from the growth of our many lightning fires has now become widespread across much of northern CA. Since Sunday the 22nd the atmosphere has been generally stable which, along with shading caused by the smoke itself, has tended to limit smoke rise. In the most-affected areas inversions have lasted into the afternoon hours, and even where they break or lift, the vertical lapse rates have not become as steep as they could under totally sunny conditions. Due to these factors, some (or most?) of our fires have probably not yet seen the maximum fire behavior/ spread rate/ spotting potential that they could see. What could change soon: We expect to see a trend toward less airmass stability over the next few days. It may well begin Thursday p.m. over the Sierra Nevada fires, from about the Plumas NF southeastward, and continue into Saturday. But for most other portions of northern CA the trend will start Friday and continue through the weekend. This will be due to a low pressure area west of CA slowly deepening and gradually expanding its area of influence toward the state. While the overall shift toward less stability might be gradual, the effects seen locally on a given fire complex could occur within one day’s burning period. In fact, the switch from barely stable to moderately unstable can occur in as little as 1-2 hours. A change like that could cause a fire to vent much better and become considerably more active (compared to previous days) in short order. [It’s not all negative – a couple of upsides associated with these type changes would be better air quality, and increased opportunity for Air Ops]. Over the next few days, the atmosphere will trend toward being less stable than it has been the past few days. Smoke will begin to lift better, and probably earlier in the day, in many areas on Friday. On a given fire, the stability lid ‘could come off’ in rather short order, leading to rapid fire behavior increases, while also allowing for increased winds at the surface. If a vantage point exists, have someone monitor for changes in observed smoke behavior (such as the ending of smoke pooling /layering in your area, or increasing rates of smoke rise, with smoke thinning quickly). - in some cases visibility starts to improve quickly. Current Situation: State and Federal firefighters continue to battle hundreds of wildfires throughout Northern California. Priority of firefighting effort is for the protection of life, property and natural resources. Fire activity remains high due to weather and fuel conditions. Download the latest fact sheet. Highway closures: State highways and local roads are closed throughout northern California due to wildfire activities. Closures are in place for state highway 32, 36, 70, 89, 96. Delays are in place for state highway 299. Numerous county and local roads are closed as well. Travelers are advised to check with law enforcement agencies prior to traveling. Evacuations: Areas of Butte County and Shasta County are under evacuation orders at this time. Precautionary evacuation orders are in place for areas in Lassen, Modoc, Mendocino, Trinity and Shasta counties. Residents are advised to monitor the fire situation in their areas, check with local law enforcement agencies for information, and be prepared to evacuate when necessary. Structures Destroyed: 17 residences, 1 commercial, 19 outbuildings. Current Situation Summary: State and Federal firefighters continue to battle hundreds of wildfires throughout northern California. Priority of firefighting effort is for the protection of life, property and natural resources. Fire activity remains high due to weather and fuel conditions. Please see summary of fire resources, closures, and evacuations below. Butte Unit: The Butte Lightning Complex consists of 31 fires burning 7,000 acres. The fires are evaluated each day to determine potential risk. Click Butte Lightning Complex for more specific information regarding the fires, closures and evacuations within this incident. The Butte Fire Information Number is (530) 538-7826. Siskiyou Unit: All fires have been contained. The Klamath National Forest has the Siskiyou Complex which is near Happy Camp that is 2,000 acres with 5% containment. The Siskiyou Fire Information Number is (530) 493-1518. Mendocino Unit: The Mendocino Lightning Complex has reported approximately 106 fires that have burned approximately 21,294 acres. 34 of these fires are contained. Incident Command Team #4 has been assigned to this complex. Click Mendocino Lightning Complex for more specific information regarding the fires, closures and evacuations within this incident. Evacuation Warning Issues. The Mendocino Fire Information Number is 707-467-6426. Humboldt-Del Norte Unit: The complex has 56 fires that have burned for more than 973 acres. There are currently 13 active fires in this complex. The Paradise Fire is north of Shelter Cove and is 600 acres and 25% contained, The Redcrest Fire is 35 acres and 100% contained, the High Fire is in Humboldt Redwood State Park is 45 acres and 100% contained, the Carson Fire is 66 acres and 100% contained, the Hansen Fire is 6 acres and 100% contained, the Williams Fire is 40 acres and 100% contained, the Larabee Fire is 45 acres and 100% contained, the Lone Fire is 80 acres and 100% contained, the Williams Fire is 40 acres and 100% contained, and all the remaining fires of 5 acres or less have been contained. The Humboldt-Del Norte Fire Information Number is (707) 726-1225. Shasta-Trinity Unit: Over 157 fires for a total of 12,000 acres. 68 of the fires have been contained. The Shingletown fire is 470 acres and 100% contained, the Venture fire is 1,200 acres, the Donkey fire is 3,000 acres and 60% contained, the Democrat fire is 500 acres and 20% contained, the Kirkwick fire is 2,400 acres and 80% contained, the Stien fire is 500 acres and 20% contained, the Withrow fire is 500 acres and 40% contained, the Moon fire is 2,000 acres and the Barkley fire is 1,000 acres. Incident Command Team #10 has been assigned to this complex. Shasta-Trinity Unit Information (530) 225-2510. Lassen-Modoc Unit (including Plumas County): The Lassen-Modoc Lightning Complex consists of 49 fires burning more than 5,050 acres. Click Popcorn Fire for more information on this incident. Sonoma-Lake-Napa Unit: The Sonoma-Lake-Napa Lightning Complex consists of 6 fires. Two fires are still burning for a total of more than 12,686 acres. Click on Wild Fire Incident or Walker Fire Incident for more information on these incidents. Tehama-Glenn Unit: The Tehama-Glenn Lightning Complex consists of 41 fires. 39 of the fires have been contained, while two remain active. The Antelope Fire is 4,200 acres and 20% contained and the Mill Creek Fire is 7,000 acres with no containment. Click Tehama-Glenn Lightning Series for more specific information on these incidents. The Tehama-Glenn Unit Information Number is (530) 528-5193. Tuolumne-Calaveras Unit: 9 fires for a total of 153 acres. All fires have been contained. Currently the counties of Tuolumne and Calaveras are experiencing heavy smoke in low lying areas due to fires caused by heavy lightning activity yesterday. The Tuolumne-Calaveras Information Number is (209) 754-5527. Madera-Mariposa-Merced Unit: 15 fires have been reported for more than 6,000 acres. The Oliver Fire is located in the Ponderosa Basin and is 2,000 acres and 20% contained. Click Oliver Fire for more specific information regarding the fires, closures and evacuations within this incident. The Madera-Mariposa-Merced Fire Information Number is (209) 966-4784. Santa Clara Unit: Click Whitehurst/Hummingbird Incident for more information on these fires. San Mateo-Santa Cruz Unit: All fires have been contained. Amador-El Dorado Unit: All fires have been contained. Nevada-Yuba-Placer Unit: All fires have been contained. A voluntary evacuation is in place for upper Pine Canyon and Arroyo Seco. An evacuation advisory is in place for lower Pine Canyon and Thompson Canyon. Reliz Canyon Road and upper Pine Canyon Road remain open to residents only. Although no evacuations orders have been issued at this time, decision points have been established. An evacuation center has been established at the King City High School. For information on fires burning on the Sierra National Forest please call 559-877-2218. 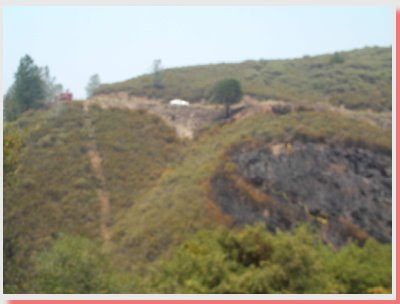 Silver Complex (CA-SNF-0715) 818 Acres, 50% contained. Within the Silver Complex are the Star, Silverknob, Chiquito, and Westfall fires. The Westfall is contained while the others continue to burn at moderate rates of spread. The Star Fire is heading towards the Yosemite National Park and town of Wawona with potential to burn into heavy timber that has no burn history on record. These fires only have ground resources assigned with all area resources depleted. The Star fire is 180 Acres at 0% in a steep, rugged, inaccessible area complicating suppression efforts adjacent to a large unburned drainage. Silveknob is 480 Acres at 60%, Chiquito is 52 Acres at 60%. ONC – Order 1 T1 team staging Sac. The Eagle fire off of the Shasta National Forest is moving towards Junction City. Fire is less than a 1/4 mile away and mandatory evacuations are taking place. Smoke will be another issue this morning, limiting the daytime heating and surface winds during the afternoon hours. However, later this evening and tonight winds will pick up across the far Northern Sacramento Valley and adjacent foothills. These winds will be from the N to NE at 10-20 mph across many exposed areas, along with poor nighttime humidity recovery. Some areas in the Feather Drainages could see gusts over 35 mph late tonight thru Friday morning. Afterwards, by Friday afternoon all eyes will be on the next thunderstorm outbreak, moving in from the Sierra and shifting NW into much of Northern California through the weekend. Many of these storms could be dry. FIRE INFORMATION SUMMARY (REPORT GENERATED FROM ICS-209). Problems / concerns: Fires are immediately threatening communities. The air was stable last night, so fire activity was minimized. The inversion layer still dominates the incident area. If the inversion layer lifts, fire intensity will greatly increase, causing additional evacuations and significant fire spread. Some of the fires are in remote areas making containment difficult and will require large numbers of hand crews. Critical Needs:47) Type I Handcrew ST, (26) Type III Engine ST, (36) DIVS, (17) Type II Dozers, (2) Type II Dozer ST, (5) Type I helicopters, SOFR, FOBS, DOZB, (9) Type III engines. Problems / concerns: Continued heavy resource commitment continues across the SHU unit. Evacuation orders have been lifted for Shingletown and Burney. Increased fire activity in new locations is causing control challenges in addition to structure threats. Critical region drawdown is resulting in numerous outstanding resource orders. IR flight is critical to success of the incident. New fires have begun in Branches V and VI, west of Redding, which are not staffed , inaccessible and have large growth potential. Approaching weather system for the weekend will challenge control lines and potentially increase size of newer fires. Problems / concerns: Commercial) on Shasta Bally are fairly severe from fire damage, the powerline is not In order to protect the powerlines the use of heavy lift helicopters would be needed to contain the spread of fire to the powerline structures. These towers are used by television, radio, and numerous public and private agencies and companies for two-way radio communications in the greater Redding area. Protection of power lines to the communication site is critical for them to maintain operations. WAPA high voltage transmission lines will be threatened if fire 5-3 (Boulder) continues backing downhill and merge into the 5-2 (Bally fire). The extreme terrain and need to contain the fires with indirect lines requires the use of experienced type 1 or type 2IA rated crews. Problems / concerns: Multiple fires with minimal staffing with evacuations in place or imminent: Red Mountain: 1500 acres, 0% contained,200-300 structures threatened, Lat/Lon 39 51’52” -123 39’53” Jack Smith: 700 acres, 0% contained, 20 structures threatened, Lat/Lon 39 16’ 20” -123 19’ 24” Orr Series: 600 acres, 0% contained, 50 structures 1 resort threatened, Lat/Lon 39 41’1” -123 23’52” Navarro: 3,000 acres, 0% contained, Lat/Lon 39 12’ 43” -123 37’ 60” All fires need fixed wing and rotary aircraft, fire crews and engines. Heavy resource drawdown is leaving 2/3 of the fires unstaffed. Inaccessible, steep terrain. No Unit coverage, all stations are unstaffed. Private timber companies are contracting to implement additional suppression activities. Problems / concerns: Lack of resources continue compromising control objectives. Air quality health issues are currently affecting the I-80 corridor from Reno to Auburn. Communities affected by smoke include Auburn, Navada City, Grass Valley, Foresthill, Colfax, Truckee, Reno, as well as numerous other smaller communities. Smoke inversions continue to make it difficult to determine fire size. Potential for rapid fire growth exists when inversion lifts. Threats to significant values along the I-80 corridor exist with fire spread to the north and west on the Government Springs Fire. No resources currently available for implementation of suppression actions. Critical Needs: 2-T1 Helicopters, 3-T2 Helicopters, 3 T3 Helicopters, 5 Type 1 Hotshot Crews, 15 Type III Engines, 2- Division Supervisors. Problems / concerns: Lack of crew resources are limiting the effectiveness of suppression tactics, lack of critical air support to provide fire intelligence, situational awareness, water support and fire fighter safety. Hwy 20, Hwy 49 and numerous communities are potentially threatened. Lack of resources is compromising control objectives. Fires continue to pose a public health hazard to local communities within the fire areas due to smoke. Areas of dense smoke could pose a potential road hazard. The closure of high use camping/recreational areas that will continue through the 4th of July weekend will affect the local tourist based economy. SPI lands in the area of the Celina are now threatened. Critical Needs: 5 Type 1 IHC, 5 Type 2 IA crews, 3 ST Type 3 eng, 5 DIVS, 5 DOZB, 2 sets fallers, 3 FELB, 4 OPBD, 2 SEC 1, 2 SEC 2. Problems / concerns: The Lime Complex was comprised of approximately 70 fires ranging in size from spots to several over 2,000 acres in size. Of the original 70 fires 17 are contained, a number of fires have merged in the area south of Hyampom. The Noble Fire is approximately 2 miles south of Harrison Gulch, 2 miles S/W of Platina. The Noble Fire has become established in the Beegum Gorge and is approaching alignment with the community of Platina. Numerous fires are in remote areas with steep terrain and limited access. Priority fires have been identified and include four that pose a significant threat to life and property: Fisher, Handy Gap, Telephone, Noble, Deadshot, Slide, and Miners. Projections in the 24 to 72 hour time range show the communities of Widwood, Hyampom and Platina to be directly impacted by the Slide and Noble fires respectively. A critical priority in maintaining the integrity of Highways 36 and 3. Highway 36 has the potential to be closed due to activity of the Telephone fires. Critical Needs: 10-Type I crews, 4-Type II IA crews, 1-Type 2 helicopters, 1-FBAN, 1-Aerial Sphere despenser operator, 1-SEC 1 or 2, 1-SECM, 12-single resource engines-any kind and type, 2-RADO. Problems / concerns: Unstaffed fires continue to grow. Accessibility is a problem due to difficult terrain along with many forest roads being closed by blow down. Approximately 11 of 36 fires are in the Trinity Alps Wilderness area. Many of the fires will require type 1 crews and air support. Several groups of fires are burning together and consolidating specifically on the Ironside Mtn., and the Green Mtn. Inversions and smoke in the canyons are limiting the use of air resources. Suppression action is occurring on the Eagle Fire, the Cedar Fire, Canadian Fire, and the Dedrick Fire. Point protection is occurring on the Ironside and Ziegler fires. The Half fire from the Six Rivers has come onto the Shasta T and Six River resource are taking suppression actions. One new fire was Initial attacked, 3 miles west of Junction City on Hwy. 299, the Cutthroat fire was contained at about 50 acres. Within the next 12 to 72 hours a total of 6 residential area will be threatened. Problems / concerns: Fire is burning in the Ishi Wilderness, structures and land holdings threatened. Fire is reported to be approximately 7000 acres but only 1500 on the forest. Problems / concerns: In inaccessible area, lack of resources causing fires to increase in size. Social/political concerns are smoke in communities. Critical Needs: 2 Type 2 Helicopters, 6 Type I crews, 2 FOBS, 2 STLC, 2 ENGB, 1 COML, 6 Type 6 Engines, 3 FELB, 4 DIVS, 2 OSC2, and FBAN. The Onion Fire has high potental to close Cal Highway 32 in the next 1 to 3 days, which is the primary link between Chico and Chester. The Cub fire has a high potential to grow into a long duration (multiple team rotations) incident. High probability of significant public health issues to the communities in the Lake Almanor area. Economic impacts on local communities will be high. The window of opportunity to take direct suppression on this fire is closing. Type I crews are critical due to the terrain and coyote tactics needed to take direct action. Aviation resources will be critical to support the operation. Problems / concerns:The fire is now burning in small to medium sized commercial timber. Heavy spotting over the line in dry fuels is occurring under gusty winds of 16 mph during the afternoon. Problems / concerns: Spotting potential. Holding the line. Firing operations suspended due to wind. Critical Needs: 10-DIVS; 1-ATGS; 1-OSC1; 3-OSBD; 12-T1 Crews; 5-T3 ST Eng. ; and 2-STAM. Problems / concerns: Heavy fuel loading with very steep and inaccessible terrain. Extreme dry fuel moisture at levels normally not found until late August. Multiple mines posing a hazard to firefighters. National/Congressional interest in fuels management pilot project (Herger-Feinstein Quincy Library Group Forest Recovery Act) for intensive forest management. Economic effects to communities dependent on timber industry and tourism. Planned music festival in Quincy next weekend. Lack of sufficient suppression resources. Limited communications due to terrain and large incident area. Possible threat to Hwy 70 in the Cold Fire area. Critical Needs: 6 STRIKE TEAMS OF TYPE 1 HANDCREWS, 2 STRIKE TEAMS OF TYPE 2 HANDCREWS, 2 STRIKE TEAMS OF TYPE 3 ENGINES. Problems / concerns: PRIORITY'S 1. 1-8 LAT 40 14.13 LNG 121 54.7 ANTELOPE CRK FIRE 4,200 ACRES 20% CONTAINED 2. 1-1 LAT 40 08.74 LNG 121 51.74 MILL CRK FIRE 7500 ACRES 0% CONTAINED. 3. 3-9 LAT 40 14.65 LNG 122 40.23 VESTAL FIRE 181 ACRES 95% CONTAINED 4. ASSIST SHF WITH THE NOBLE INC TO KEEP FIRE FROM ENTERING TGU DPA PRESENT FIRES ARE LOCATED IN THE AREAS OF THE FINLEY AND CAMPBELL FIRES, THEREFORE THEY HAVE LARGE GROWTH POTENTIAL. ACCESS PROBLEMS INTO THE MILL INC, LONG SLOW TRAVEL FOR GROUND RESOURCES. Problems / concerns: Steep, inaccessible terrain fires are well established and due to access, fuels, topography will have significant growth over an extended timeframe before containment/control can be achieved. Air support and type 1 crews are essential to any success. Continued burnouts will be initiated over the next week,Helicopters could provide critical support. Problems / concerns: Limited resources. Swim, Bonanza and Nielson are over 100 acres and the Travis is over 600 acres. Unable to staff all fires. Problems / concerns: Fire activity for 6/24 included major acreage increases. Increased perimeter sizes resulted in less area effectively staffed due to overhead and crew shortages. Smoke contribution in the North Coast Air Basin was and will continue to be substantial. Plantation loss on 6/24 was significant, with more expected. Habitat loss for key fisheries and faunal species is expected. Concerns over the lack of available suppression overhead, and aircraft limit options for any aggressive suppression strategies. Associated support functions not filled have resulted in limiting the amount of support the district resources can handle. Continued inability to fill orders results in the fire's potential to enter into residential areas, expected later this week. Problems / concerns: Lack of repeaters hinders significant actions due to safety concerns. Steep terrain with roll outs causing ignitions outside containment lines. Access issues related to steep terrain and heavy fuels, with few natural barriers. Unable to take significant actions without aerial support. Helicopter support is a high priority for safety. Jake fire has merged with the Portuguese fire and continues to threaten structures within the Salmon River drainage. Mountain, Merrill, and Jake fires are threatening important Cultural resources and impacting fisheries. Wooley Creek historical cabins (used by President Hoover) are in danger in addition to private property in the area. Timber resources and watersheds are of concern. Problems / concerns: Fire is inaccessible, in very steep and rugged terrain. Type 1 crews and T2 copters are needed to check fire spread in the drainage in order to keep fire within the headwaters area. 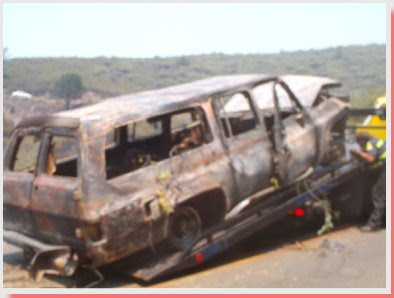 completely burnt and it appeared that human remains were in the passenger compartment. Sheriff Deputies and California Highway Patrol responded to the area. During the initial investigation it appeared that the vehicle had left the roadway, crashed down the ravine and started the wildland fire. As the investigation progressed CHP noted suspicious blood markings on the roadway. Further investigation by Sheriff Detectives located additional evidence, which lead the Sheriff’s Office to believe that foul play had a part in the death of the occupant. be conducted to determine the cause of death. The investigation is on going. Attached pictures are of the involved vehicle and wildland fire area. Red outlines shows the places where the sensor detected actively burning fires. The dry vegetation, rough terrain, windy weather, limited access, and firefighting resources slow to arrive has made firefighting efforts very difficult and dangerous. The pictures on the site shows the contrast in weather as it came in over about a 30 minute period just before the California lightning series started in the County. This is looking East into Plumas county. At least 5 plumes starting. left side, concow fire in the middle, and the Rim fire on the right. and check out their webcam - looking south over North Fork Feather River.